CERRITOS -- Ayala senior Andrew Martinez and San Clemente junior Hana Catsimanes won the varsity races at the Great Cow Run on Saturday morning at picturesque Cerritos Regional Park. Martinez won going away in 14:47.3, outpacing Loyola junior Anthony Stone, who was the top returning runner from last year when he placed sixth. Stone was second in 14:55.9. Arcadia's Jacob Hsu was third (14:59.0). Loyola lost six seniors from 2017, including Great Cow Run and CIF-Southern Section Division I champion Shane Bissell. But that didn't seem to bother the Cubs on Saturday, as they rolled to the team win as Roberto Ruelas, Vinnie Giachini and Mason Ratkovich finished 6-7-8 in a 5.5-second gap. Catsimanes, who missed most of her sophomore cross country season with an injury, rallied late to pass Arcadia senior Joyce Wu, displaying a strong kick for the victory. Catsimanes covered the flat, mostly-grassy 3-mile course in 17:37.4. Wu was second in 17:43.7 and Yorba Linda's Siena Palicke was third in 17:44.4. Ayala senior Mikaela Ramirez, winner here as a junior and runner-up as a sophomore, was unable to compete because of an ankle injury that she said she hopes will be good to go by Woodbridge in two weeks. 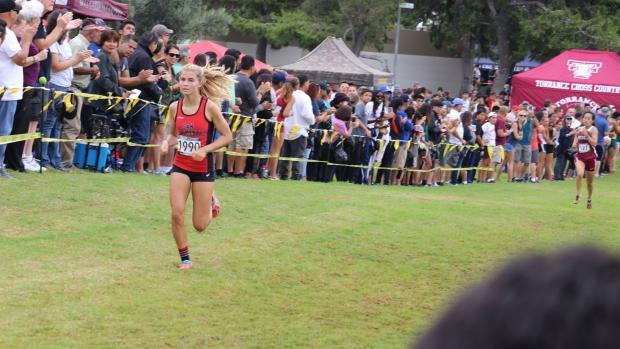 Erin Facenda, who was eighth in 18:24.6, was the top finisher for Ayala (she was fifth among team scorers). 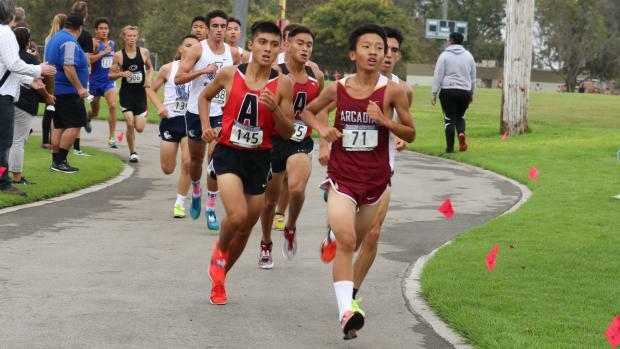 Cadence Chang (18:33) was 13th overall and 10th among team scorers as Ayala's No. 2. Even with Ramirez on the sideline in energetic support, Ayala won the girls team title over Los Alamitos with San Clemente third. Of the 33 girls teams that scored, Arcadia wasn't among them. The Apaches were only able to start four runners because of injuries, Wu said. Loyola, an all-boys school, showcased its depth, also winning the team competition at the freshman and JV levels and getting individual titles Zachary Zambrano (15:46.4) in the sophomore race, and Konnor Paris (15:51.1) in the JV race. Right behind Paris were teammates Jonathan Topete (16:07) in third, Michael Antonucci (16:12) in fifth and Tommy Donovan (16:18) in sixth. In the Freshman Boys race (won by Norte Vista's Ernesto Ruiz in 16:28), Loyola had three of the top nine in Nick Castain (16:57) in fourth, Dane Utley (17:02) in sixth and Julian Guinane (17:14) in ninth. Paramount's Maria Serrano won the Sophomore Girls race in 18:35 with the Marina duo of Makena Castillo (19:09) and Marikay Schwab (19:12) the next two across the line. Yorba Linda's Maya Krishnan, who said she moved to California from New Hampshire a week ago, won the JV Girls race (20:21). In addition to its third place finish in Varsity Girls, Los Alamitos also won girls team titles in the JV and Sophomore races.